15 posts categorized "Niche & Practice Groups"
When a person markets herself (whether online or off) and receives some attention around it, colleagues can become envious. Some may speculate that she’s not a team player, and that she’s more interested in getting her name known than the firm’s. Others might pick at her with comments like “You spend too much time on your blog, not doing client work.” Just anticipating these sentiments could preclude her from promoting herself, as if she’d be stepping out of bounds. But marketing in the professions of law or accounting is much more about relationships than about leveraging a corporate-like brand. People want to buy from people. Not from logos. Logos and brands aren’t accountable and accessible. People are. Brands are inherently impersonal yet your firm’s value and long-term appeal are based on your people. A good way to look at your firm's marketing is to view the firm as a record label and your people as performers ... with some as potential rock stars. When a label has only one rock star, you could chalk it up to luck in discovering that talent. With two rock stars signed, people start to wonder if it’s more than just luck. Three rock stars and it’s a trend: the label consistently finds and draws talent. A record label that has signed multiple stars is more prestigious among its competitors and is more attractive to aspiring stars. There’s something magical about that label; it appears to have a formula for success. Your firm should want your attorneys or CPAs to become rock stars so they can elevate the firm’s visibility and reputation. Rock-stars using social media can quickly put their firm on the map. The higher profile of the firm, in turn, raises the profile of all its attorneys or CPAs. With the visibility comes responsibility. In all his marketing interactions, a lawyer or CPA should associate himself with his firm in appropriate ways. Online, this means naming the firm and linking to the firm’s website within his bios on social sites like LinkedIn, Twitter, Google+, and blogs. This doesn’t mean that every profile or photo needs to incorporate the firm’s branding, just that the connection to the firm is consistently reflected on social sites. And if the person avoids referring to the firm, you might have reason to question his purpose in marketing so independently. But this isn’t just a social-media problem, it’s an age-old concern. I know of a partner who contributed an article to a local print publication and refrained from naming his firm in his byline. He confessed his intent was to distance himself from the firm—he felt the firm didn’t support his interest in marketing. Whatever his reason, his behavior reflected an underlying problem. The behavior was just the symptom, the root cause was a deeper issue. In a scenario like this, be careful to address issues like these for what they really are. Don't let fear preclude you from nurturing rock stars. So there’s this one lingering concern: what if you do support the growth of a rising star, and then she leaves your label? Your big stars could certainly migrate just as top artists change record companies. This is one reason it’s best to have several rock stars. It’s true that blogs and social networking sites make it easier than ever for people to build visibility and social capital. And this certainly means they can leave and take this social capital with them. The important thing to remember is that your firm’s stature is already higher for being associated with your stars. That stature stays even when they go. There’s one way to be particularly proactive about associates or partners possibly leaving that also inspires people to want to create content: establish who will own content like articles and blog posts. Regardless of the firm’s ability to assert copyright, the wiser approach is a generous spirit of sharing. Agree to let authors use their own articles even after they leave while being clear that the firm can also continue to use the content. When a firm insists on solely owning the content, it creates a disincentive for people (especially non-partners) to contribute their intellectual capital. I’ve seen this completely kill blog efforts, which is a shame because providing content is some of the most valuable marketing you, in a knowledge profession, can do. Alternately, if the departing attorney or CPA solely owns her content, the firm faces a hassle of scrubbing blogs and websites to remove her content. Keep it simple and take the high road: agree that the firm and the departing professional can both use it. When your firm aspires to create, equip, and support as many rock stars as it can, you’ll have far more success than trouble as a result. Encourage your practitioners to create content and participate in social networks to raise both their profiles and the firm’s. Feature photo courtesy of feiticeira_org on flickr. Specialists, Are you Charging More Yet? Why Not? Being known for providing specialized services is powerful form of branding. And the whole point of branding is to increase profits through being able to command premium prices. CPA firms are good at developing specialities, but most totally miss the boat on leveraging the speciality when it comes to their pricing. Even when their capacity is full! The two key situations that set you up for raising prices are a) being a specialist and b) being at or very near capacity! These perfect price-raising opportunities are too often overlooked. Don't leave all that money on the table! (and the amount left unsold doesn't EVER show up on the balance sheet! Had such an amazing time yesterday in Houston at the Assoc. for Accounting Marketing Houston Chapter's meeting where I have a talk on Personal Marketing Plans. It covered the process and mindset for creating them, as well as execution tips for both practitioners and the marketing professionals that support them. The attendees were wonderful and asked fantastic questions during and after the session. In follow up to them, and a resource to readers who couldn't attend, I am linking to my slide deck. I also have some of the content in the slides (around the pie chart on slide 18) in a different format--a mind map. Further, on the mind map, all the items that are in "red" are items that can be achieved via social media in addition to traditional means. Lastly, I have a past post "What's in a Plan? Marketing Plan and Budget Development" that's related to this topic. You might find it of interest (it includes an older version of this Mindmap so use this version because it's been updated). I would love to hear from attendees (and others!) on your progress and questions are welcome anytime. 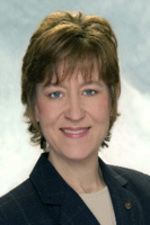 I'm belated in posting this very solid article written by my blogger-friend Tracy Coenen of Sequence Inc: "Providing Forensic Accounting Services as a Small Firm" published originally in FOCUS - Newsletter of the AICPA Forensic & Valuation Services Section. Tracy is author of Essentials of Corporate Fraud, a book opportunity that arose, in part, due to her excellent blog, The Fraud Files Blog. 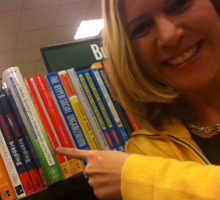 Her second book, Expert Fraud Investigation: A Step-by-Step Guide is scheduled for release on Feb 9. Sounds like a lovely gift for your favorite CPA. He has two other CDs: Just Take A Sick Day and Magical Boxes, and he is available for booking. Might be perfect for a firm holiday party or end-of-tax-season gathering. Through his music, he is definitely distinguishing himself! He's an alumnus of a Big 4 firm now in private tax practice. This (similar to blogging) is an effective way to humanize oneself! The Accounting Crows are "Connecticut's only CPA Rock 'n' Roll Band." However, as auditors who recognize the importance of the rule called "full disclosure," they quickly point out that only 3 of the 4 members (or 75%) of the band are CPAs. So who is the "other 25 percent" of the band? Mark Zampino, the Crow's keyboard player and only non-CPA, is the Public Affairs Director of the Connecticut Society of Certified Public Accountants (CSCPA) and DNA-tested father of both the band and its name. They are dynamite! My friend and AAM 2003 conference co-chair, Anne Angera and I booked them to kick off our Boston conference, the theme of which was "Revolutionary Marketing" which they epitomized. While their band must be pretty good to have this many bookings, they exude fun, and they poke a lot of fun at themselves on their website. Lead guitarist Alan Friedman, partner at Friedman Kanneberg in CT, has a practice that includes consulting in the music industry. And he leverages his band extremely well to benefit the accounting business as well as pro bono for important causes. Their specialization claim is very nicely substantiated on their website, illustrated by his firm's membership in these organizations: National Assoc. of Music Merchants, Retail Print Music Dealers Assoc., National Assoc. of School Music Dealers, Percussive Arts Society, American Music Conference, and Audio Engineering Society. As if the memberships weren't support enough, this impressive list of representative clients clinches it. Just read our band bio and you'll understand why we always need some heavy-duty musical stand-ins when last minute gig plans go awry. We never know when Reed is has not-for-profit audit overseas in Outer Slabovia, or Mike has to furnish his board of directors with a 50-page cost containment report requiring him to look up the word "containment" in the dictionary, or John has to be billable for a change, or Mark has to pretend to do something important for the CSCPA, or Alan has to go to the bathroom. Accordingly, The Accounting Crows need either real CPAs or real musicians (as there's no such thing as a real "CPA musician") to be available when a band member's schedule conflicts with any one of the two important gigs we get each year. All these CPAs deserve kudos and a closer look for gleaning ideas about how to successfully differentiate in a crowded marketplace. Any other accounting musicians out there? How about rock-n-roll lawyers? Hat tip to Greg Price for posting about Zelin on his blog From Greg's Head! It’s time to create your firm’s annual marketing budget. Hopefully, you’ve already read my “part 1” post, “Plan Your Marketing Budget.” This is in response to an "Ask Michelle" Q&A post. Start with a spreadsheet that has a couple columns on the left for your initiatives by various groupings (more on that below). Then you'll need a column for Timing and one for assigning Responsible Person. To the right of that, I recommend columns for each quarter of the year or you can do months if you want to get that micro--and then create a "total" column to the right. These columns are where you'll include any anticipated expense in the periods you expect to pay them. Not all items will have related expenses. Try having high level categories for the firm, overall (this will include initiatives you cannot tie to any specific industry or service area), and then for each Practice Area (can be industry or product/service) that you are actively building or promoting. Existing Clients. Usually the most important area of focus yet, usually, little is allocated to this area. Influential People/Referral Sources. Very important, and includes current clients. New Business. Where people tend to allocate the most time and $, yet somewhat less critical than the first two. Marketing Infrastructure. A potentially bottomless pit of marketing expenditures – make sure to do just the things you need to support the initiatives you’ll undertake, above. Most of this work should serve to convey your firm’s credibility, value, and personality. Remember, professional services are relationship businesses, and personality overshadows technical competence. Research & Development. In order to stay relevant, you have to continually reinvent some aspect of what you do. 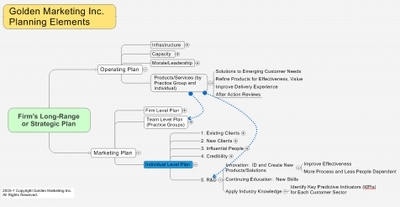 I talked about this a lot in my post "Product and Service Improvement in Your Marketing Plan?" The initiatives you’ll include in your plan won’t all have costs associated with them, but be sure to include them, their timing, and the responsible parties, anyway. This will help accountability. It will also help the marketing department have the "What comes off our plate if we shift gears and take on this unplanned work?" discussions that frequently arise. It's easy to come up with lots of "bottomless pit" ideas, but where ROI is strongest is where specific clients, referral sources and new businesses are reached and impressed. If you're stumped for ideas, you might find the following helpful. Some specific items you might include in your plans are identified in my charts below. The first one depicts some R&D type items you might undertake. These are best assigned by the firm's operational management group (for buy-in and accountability), but are best carried out by practice area teams flowing down to the individuals who are/should be in touch with the affected clients/prospects. This second chart (also making available a PDF of this as the pic is somewhat small) shows a several initiatives that you might undertake at the practice area or individual practioner level. While your marketing department can do a lot of the prep and coordination, most results ultimately come down to what the practitioner does or does not do. This is why it is so important to include practice group and individual "big picture to dos" in the firm's marketing plan. (Their detailed "to dos" can go into their individual marketing plans). It really doesn't matter whether you start with your firm level plan and drill tasks down to a practice group, then individual level, or whether you start with individual plans and stream those items upward to practice areas and then into the firm level plan. Firms usually find one of these ways easier to begin than the other. It all depends on your firm. Also, I'm happy to share a plan shell in Excel. It has a few ideas sprinkled in but is very generic. You would want to add additional sections for each of your practice areas. Note the Red items are DIRECT marketing and the Green items are INDIRECT marketing. If you want your plan to generate results, plan a lot more activity in the "direct" areas! Product and Service Improvement in Your Marketing Plan? Yes! If you don't have an Operating Plan as part of your firm's annual Strategic Plan. Continuing to improve what you deliver (services are products, too) and how well you deliver it meddles in your processes, systems, tools and training...clearly areas "outside" of the marketing department. Or are they? Product quality, which products you deliver, and the finesse with which you deliver them are pretty fundamental in your ability to survive and thrive, long term. Isn't that why you are in business? Product development is essential to evolving with your customers. And to besting your competitors through setting yourself apart. You either want to do altogether different things than your competitors, or do the same things, but do them differently...better. So the Operating Plan and Marketing Plan should work in tandem and be integrated—not in isolation of one another—to support the Strategic Plan. But, alas, most firms don't have Operating Plans at all. If yours does, be sure to include these Product Development initiatives in a category I'll refer to, here, as R&D (research & development). 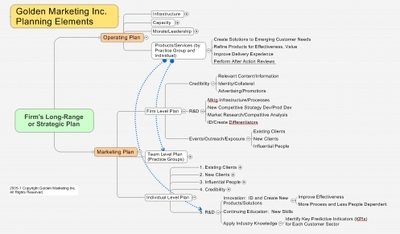 If your firm doesn't have an operating plan, then be sure to account for R&D in your marketing plan. 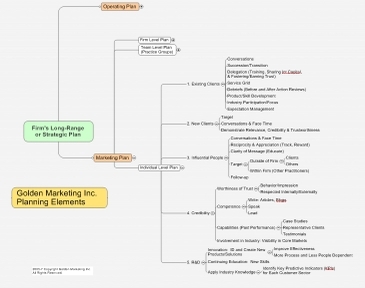 This chart shows essential top-level elements of Operating and Marketing Plans—expanded to show more details in the areas I'm referring to today. Click to Zoom. Focusing on R&D is also focusing on your current clients—part of marketing. And focusing here ensures you clarify and streamline your processes so that high-quality services are provided as effectively and efficiently as possible. This impacts good use of personnel capacity, increases the recognition of need for training and delegating, and directly impacts the profitability of each project or job. Profitability is one of the reasons you "do" marketing, right? But profitability and marketing all too rarely intersect within firms...a problem worsened when segregating marketing from your operations and vice versa. See my earlier post, "Don't Separate Marketing From Strategy" for more on this. Every critical operating or marking initiative shown in my chart needs to be interwoven into your team members' personal action items or they are likely to go undone. Placing product/service-related items in marketing plans is not unreasonable. Mentoring and people development is another area I often place into personal marketing plans. I suppose this really turns an Individual Marketing Plan into an Individual Practice Plan and that is a-OK. Call it whatever you like. But ignore these crucial activities at your marketing's peril. My associate Sue Sassmann and I spent last week out in steamy Savannah, GA at the Association for Accounting Marketing conference. We had a blast catching up with old friends and meeting new people. I did a little presentation and we exhibited to launch our new project-oriented training for marketers. Great time. The highlight, though, was winning an AAM Marketing Achievement Award for the niche-building campaign we've worked on over the last year with Tulsa CPA firm Stanfield & O'Dell. Part of the firm's action plan included development of a blog...truly unchartered waters (see conference theme...) for CPAs. S&O's blog for ministries was the second "industry" niche blog by CPAs and the first by a multi-partner firm. These guys are true trailblazers and their results have been quite good and swift, too. 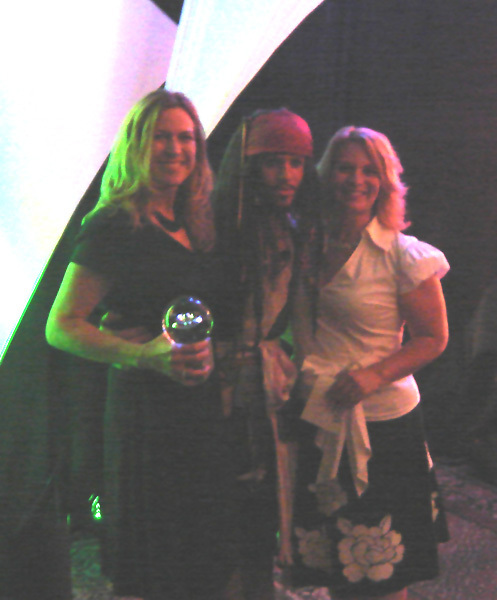 We're pretty excited to be part of their success as you can see from this picture (that's Captain Jack Sparrow between me and Sue--she's on the right). The...campaign centered on growing the CPA firm’s practice specific to Christian ministries across the United States. The campaign included not only the blog written by the firm’s practitioners for national visibility, but also promotion of the blog by mail, trade-show appearances, and trade-publication advertising. “We’re pleased with the visibility this award brings to the value of blogging for professional service firms,” explains Michelle Golden, president of Golden Marketing, Inc.
Golden...notes that there are only 23 blogs authored by licensed public accountants for the purpose of reaching current and prospective customers. Of these 23 blogs, only four are industry-specific rather than service focused (e.g. general accounting, tax or other services). The Ministry Blog was the second of the four to launch. “In contrast to the legal profession, accountants have almost no presence on the Internet,” says Golden. “There are thousands of lawyers who blog and are experiencing unexpected benefits from the relationships they are creating. Accountants are far more skeptical of this medium of communication and are far behind when it comes to understanding and working with social media. The firm's ministry practice group has been hugely dedicated to this effort and started writing their backlog of content last summer so their blog is already chock-full of information. They are launching now with a fanfare. I believe that Stanfield & O'Dell's blog is only the second industry niche blog produced and actively maintained by CPAs/CAs. The other is a healthcare blog produced by Reed Tinsley. If readers know of other industry specific blogs, I'd love to hear about them. There are about two dozen blogs that are authored by CPAs/CAs about taxes, business valuations, fraud, and technology services, but these don't focus on particular industries or sectors served. In other words, they are service-based and geared to a general audience. In the interest of full disclosure, Stanfield & O'Dell is a client of Golden Marketing. Surprisingly, when we urge professionals to spend more time thinking intentially and proactively about their clients (instead of just working on bringing in new biz), we are often met with looks--or even heavy sighs--that suggest, "you've got to be kidding." increase the number of project opportunities relative to meeting customer needs--needs you won't know about or be able to help them with if you aren't TALKING with them. Which of the Following Marketing Tactics Has Your Law Firm Found to be Most Effective at Generating New Revenue? Meeting with customers AND specialization (reflected in organizational involvement) reign. Make news and info come to you and enhance perception of the depth of your specialty. You may already subscribe to blogs, but do you subscribe to "searches"? Subject search results can be amazingly informative. Using Bloglines or another blog aggregator, search (top right of page in Bloglines) for key words related to an important client’s or prospect's industry (e.g. tool and die, over the road trucking, funeral homes, veterinary services, apparel, importing, etc). Add the search results to "your feeds" and skim for five minutes per day--occasionally forward items of interest to your client. As leader of a national marketing advisory and implementation practice (Golden Marketing Inc.) I was interviewed by Association of Accounting Marketing about my thoughts on measuring marketing efforts. An excerpt of the interview was used for an article in AAM's newsletter, but here is the interview in its entirety. What marketing programs have you chosen to measure? Just about everything possible! As an outsourced marketer for firms, there is even more scrutiny with regard to cost/benefit for marketing dollars spent. In-house marketers face much the same pressure, though, so similar tactics can be very helpful for marketers employed within their firms. But even where the marketer is in pretty full control of an initiative, it is common for marketers to over-sell the benefits of a proposed marketing initiative in order to gain the support needed to try it at all. This is dangerous but happens all the time. Setting goals and expectations with the partners that are reasonable and realistic, and then quantifying the expected results, are critical to our company staying in business. Mastering this is just as critical to keeping ones job as an in-house marketer. Other projects taken on by marketing are measured against their time line and budgetary expectations as would be expected in any corporate environment with regard to accountability by a department: Web/brochure development, timely PR activities, proposal development, procedural development, internal consulting, practice area support and leadership, and other various functions. Above are the words of John Jantsch in his Duct Tape Marketing post: "I'm Just Going to Stop Using the 'B' Word." He's talking about blogging, of course. A powerful marketing weapon tool many firms (from massive firms to sole practitioners) are curious but tentative about--a problem compounded by the silly name. So, forget the name, and familiarize yourself with the tool. Quick! Before your competitors do it. In the session, our attendees did some brainstorming on the new concept we introduced and the following items are the results of their brainstorms. When an accounting firm establishes any formal niche, thoughtfully measuring your foothold in various industries and considering the reception you'll have within them can mean the difference between success or failure. The importance of completing a full inventory cannot be overemphasized. Inventory the clients you have in or related to the industry as well as your referral sources and potential referral sources, associations or other networking and skill building opportunities, and--most importantly--assess the industry's current needs (look BEYOND accounting needs, identify as many as possible), economic situation & outlook, price sensitivity issues, and other players in the market meeting those needs. Then inventory your internal resources, services to offer, experiences to cite, etc., and see how complete a picture your firm can paint. Where there are blanks, consider alliances for filling them and determine anyone you can collaborate with to do so (lawyers, bonding agents, software companies, etc). Picking an niche area that is likely to be responsive to you as you establish a foothold is important unless you have unlimited resources and patience. I'll pick on the construction industry to illustrate my point. I've found in many markets that the construction industry can be particularly tough to break into, and contractors can be less than desirable clients to keep, for several reasons. competition is fierce with many CPA firms, large and small, vying for the same pool of prospective clients! With all of the above issues, I am still baffled as to why so many accounting firms desire to penetrate this market! Maybe the need in the construction industry is so huge and there are enough "great" companies out there to make up for the flakier ones. Maybe CPAs just like a challenge! Before deciding which niche to pursue, consider the perils of each vertical market before jumping in. Don't start with the toughest markets to penetrate. There's probably some lower-hanging fruit that is more ripe for the picking...and tastier, too. A timeless guide to modern marketing strategies: online and off. Work is licensed under a Creative Commons Attribution-Noncommercial-Share Alike 3.0 License. © 2005-2017 Golden Practices Inc. Review license terms by clicking image or link, above. Content may NOT be used on fee-for-access sites without my express written permission. Set People Up For Success. Be a Bob. How Effective is Your Social Marketing? Kurt Siemers on Set People Up For Success. Be a Bob.